Tools allow us to be artists. They give us the freedom to take that imaginary creation in our mind and turn it into an actual piece of art to be seen by others. I can’t punch holes with my bare fingers–or my teeth. I can’t cut paper with my hands. Without rulers and straight edges, my art would look crooked and sloppy. If I didn’t have book presses or weights, I’d have to sit on my books to get them to form nicely. I collect tools, hoard them, and selfishly guard them. I do not lend them to other book artists! Awls and Bonefolders: I’ve got to punch holes in the pages of books in order to sew them. Awls have been around for hundreds of years; monks used them to make holes in their manuscripts; Venetian (Venice was the early capital of publishing and bookbinding) bookbinders used them and all we 21st century book binders use them. Little has changed in the technology. A sharp implement embedded in wood does the job. Bonefolders: These tools make clean creases and score the pages. I also use them to burnish the paper once it has been glued to the book binders board. Bonefolders also help spread the glue, and get any wrinkles out of the paper that might have resulted from the gluing. They are usually made out of, surprise, animal bones. Teflon now seems to be the material of choice. Sharp creases are important in making books and I love running my folders down the paper to get a clean crease. Paper Cutters: These machines are the most expensive of my tools. My two large ones, a Kutrimmer made in Germany, is known as a board and and paper cutter. I also have a guillotine paper cutter (a Dahl, made in the USA) which can cut through stacks of paper and binder’s board. To keep the blades sharp (and yes, they can hack a finger off) I have them hand-sharpened by specialist. Weights and Book Presses: I can’t seem to stop buying weights. We need these objects to keep binder’s board from buckling, to make sure book covers close properly, and to add that finishing touch. I have loads of them. My favorites, though, made by girlfriend’s mother, are tapestry covered bricks. You can’t go wrong with a brick as a weighty object. Book presses perform the same task. The large wooden one (the right one in the photo) was made by an Italian man who ran a book binding studio in Virginia. During the day he would play Italian opera music while his employees worked. A former employee told me that it was the most enchanting place to work. 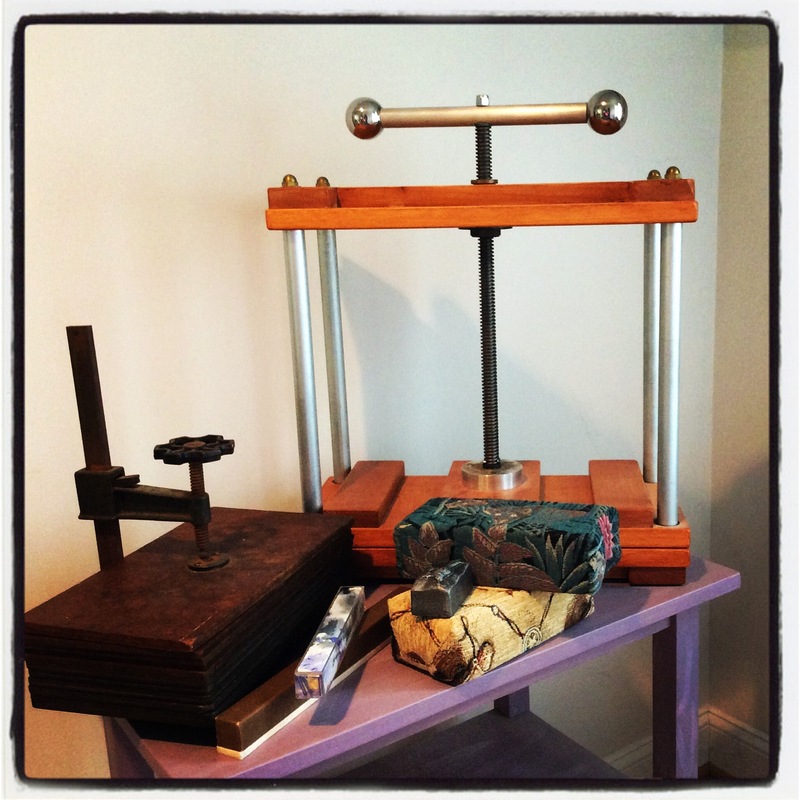 The more funky press (left in the photo) is a 1930’s textbook press. It squeaks when I turn the large handle at the top. Other Devices: Cradles help you make a hole exactly in the fold of the paper. They help me be more precise in my work. A corner cutter, takes square corners and rounds them. I only use with soft (paper) covers. Rulers and straight edges are invaluable. They help make my art more precise, and let me run an exacto knife down the straight edge for precise cuts. Scissors and paintbrushes need no explanation. “The practice of art isn’t to make isn’t to make a living. It’s to make your soul grow,” said Kurt Vonnegut. 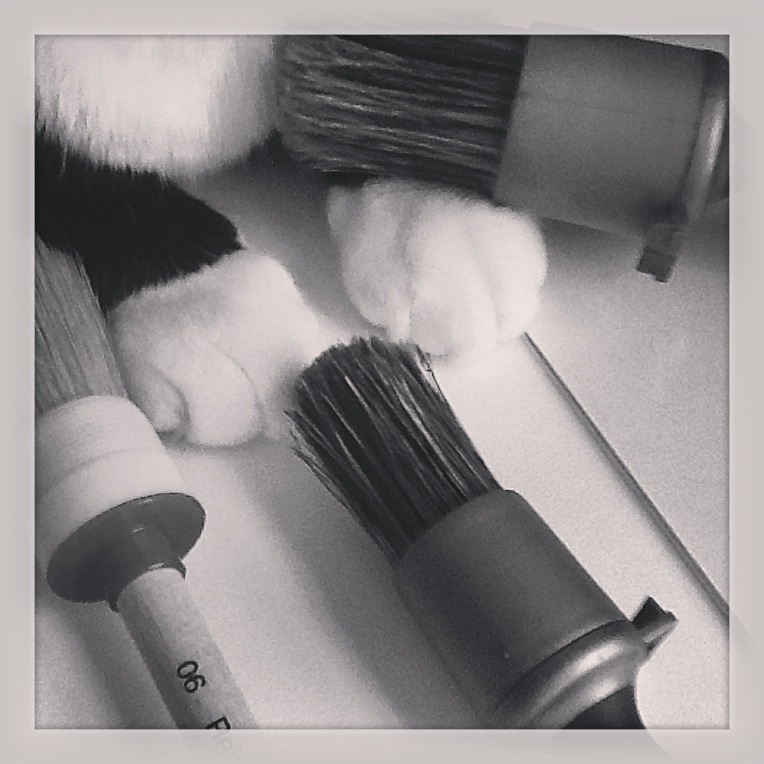 Good tools help me practice my art–and nurture my soul.